I love peas. I enjoy frozen peas steamed barely warm or thawed and sprinkled into salads, but I especially love fresh peas plucked from their tendrilled vines, shelled and popped almost immediately into a steamer on top of a couple of lettuce leaves. Cooked until they are bright green and barely tender, then bathed in butter or maybe lemon juice and pepper for those who shun butter, it’s a little bit of culinary heaven. Peas are early-season veggies that flag and turn starchy (blah-tasting is the technical term) as soon as hot summer arrives, so there is a seasonal window during which to plant for decent harvest. Depending on variety, they need anywhere from 54 days to 72 days give or take to go from seed to plate. 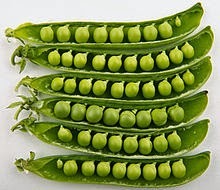 The rule of thumb here in Maryland was: Plant peas on St Patrick’s Day. Which in more ordinary years should get you safely through from poking those wrinkled little rounds in the ground until you’re blissfully scooping up warm spoonfuls at the dinner table. I’ve agonized over when to plant peas. Finally, this year, I started some in a flat and will transplant them into the garden when the weather settles down some. I’ve got a small back yard greenhouse, which I love, but you don’t need one to start plants indoors. There are back-posts in this blog that will give you plenty of good advice on how to do it at home without one. Before the greenhouse, (which saves me all kinds of money on anti-depressants), I used to start them in the kitchen and guestroom, both of which face south, and rig up some overhead full-spectrum lights to supplement the sometimes meager sunlight. 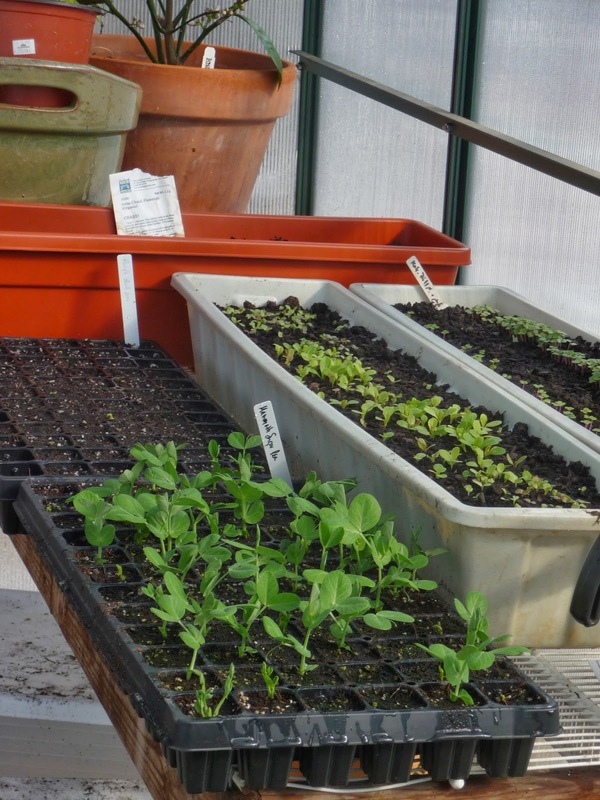 Pea plants are sturdy little things and are as easy to transplant from a flat of individual cells (so the roots don’t tangle together) as lettuce, kale, and other early season veggies. The garden centers have got their seeds in now, so browsing and imagining is fun (for some people it’s clothes or shoes, for me it’s seeds and food). A visit to your favorite garden center makes a lovely Saturday’s project – get seeds and maybe a bloom or two for spiritual uplift, chat with friendly souls there about growing things, get home and plant the seeds in flats under lights, then relax and feel good about the cycle of life. 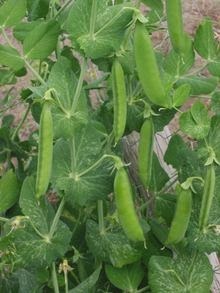 Once in the garden, peas (Pisum sativum), fix nitrogen to their roots, so they require little if any nitrogen fertilizer, which tends to produce foliage at the expense of fruit. They also come out of the garden early enough that you can plant a second crop of summer somethings where they’ve vacated, which makes them a great use of space. You can also seed some into a container at the back door – they’re really pretty climbing up a trellis and they make great snacks right out of the pod. Replace the pea plants in June or so with something like a pepper plant and a couple of different basils and maybe a thyme for jerk chicken on the grill. * Even if it the weather conditions are perfect for planting peas, if you have blackbirds and robins around, you might want to consider planting them in a meandering stream rather than a regimented row. Blackbirds and robins are marvels at discerning patterns, and once they see you put them in the ground – and believe me, they watch, especially in years like this when food is more difficult to come by – they can come down and Hoover up each seed, leaving little holes as evidence of their theft. Row cover immediately after planting also helps to thwart the birds.